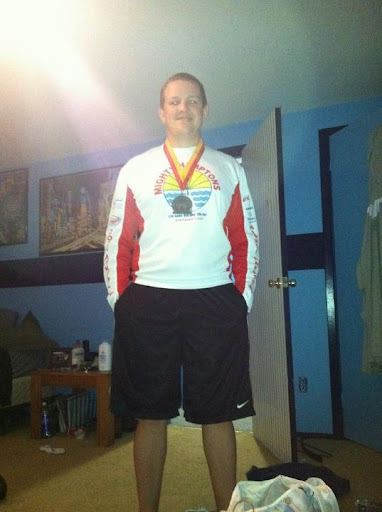 Looking back, when I was younger, I could have envisioned myself doing an olympic triathlon someday. However, I never thought I would be doing my first on the tenth anniversary of one of the most deadly attacks of terrorism in history. I was sitting in Biology class in 8th grade ten years ago on this day. 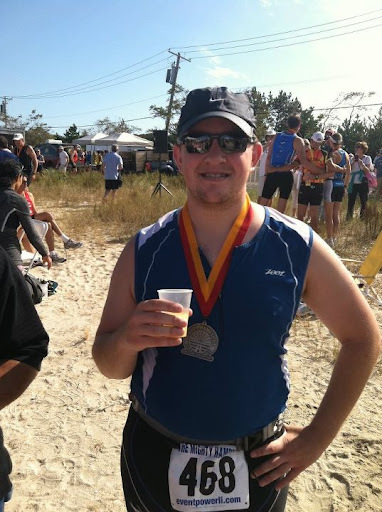 Today, ten years later, I ran my first olympic distance tri. 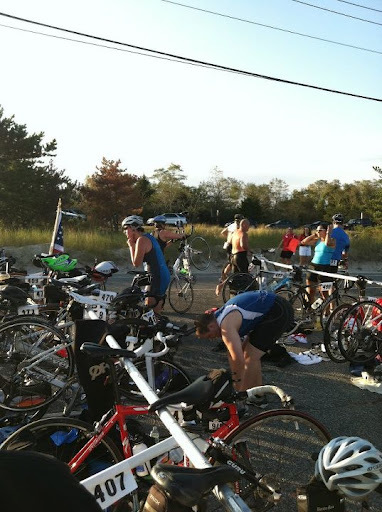 Set in Sag Harbor, NY, the Mighty Hamptons Olympic Distance tri celebrated it’s 30th annual race this morning. 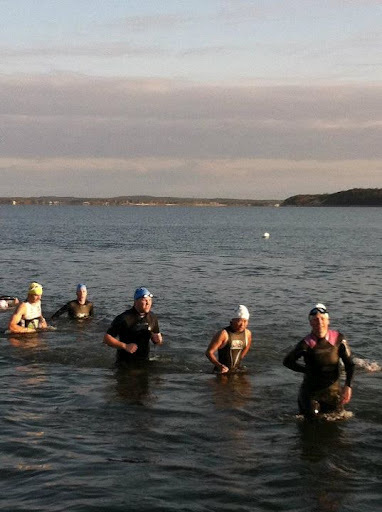 The .9 mile swim took place in Noyack Bay, the 24 mile bike leg and the 10k run were nice routes through Sag Harbor. The last two weeks my level of nervousness had increased exponentially. Between hurricane Irene and the last week pounding Long Island with rain, I hadn’t been able to get out to do much of any training. I attempted two long brick sessions before the hurricane but flatted out about half way into my bike both times. I took that as a potential sign of bad things to come. Before the race I did set some time goals for myself. During my training, I had been able to do the swim distance in just around 30 minutes, the bike distance in and hour and a half to an hour and forty minutes, and the run in just over an hour. So I had said I would have been happy with a finish faster than three and a half hours, but ideally I wanted to be closer to that three hour mark. The swim was a water start. We swam about a half mile down parallel to the beach, turned around and swam the same distance back. The waves weren’t too big, but toward the end of the swim, the water began to get more and more crowded, and then the elbows really started flying. I am pretty sure at one point I caught someone in the face with an elbow, but these are the risks triathletes take entering these races. I know at several times I was hit or kicked, so I guess in the end it all evened out. 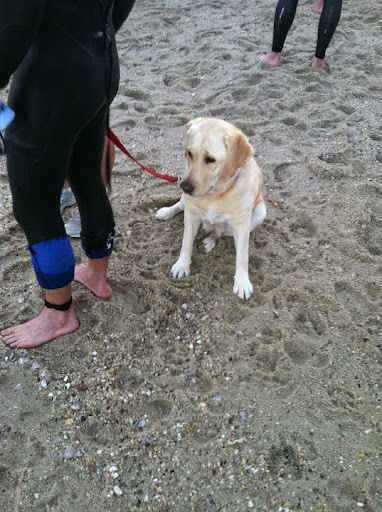 In the end, got out of the water feeling strong, and headed to transition to get onto the bike. This bike course was great! It was very scenic, and had, in my opinion, a perfect balance of up and down hills. I felt really strong on the bike (it could have been from my almost two full weeks of rest before the race) but I definitely felt like i was really moving. Unlike trirock, this course was so well marked. On the streets, there were orange arrows in every intersection we crossed to direct us as well as white signs and police/volunteers at all of the turns to direct us where to go. One other thing I really liked were the signs which read “slow, turn in 25 yards”. It made me feel as though I had ridden this course several times before. I never was worried of being lost or not knowing which way to turn. Overall, a great bike leg, with an average speed about 2 mph faster than I had been maintaining in my training. Not sure whose dog this is, or why I needed fifty pictures of it, but yes it is cute! Post race…really lovin my new Oakey Fast Jackets! I am not sure if it is written anywhere else in the blog, but I am an aspiring math teacher…have all the certifications and degrees…just waiting for a job opening. But, as a math person, I could not be more excited about my finishing time. 3,4,5 is one of the special right triangles, and my time of 3:04:05 was perfect to me! I am happy with my time, but there is definitely work to be done. I think in the winter months, I will certainly be focusing a lot on my run.